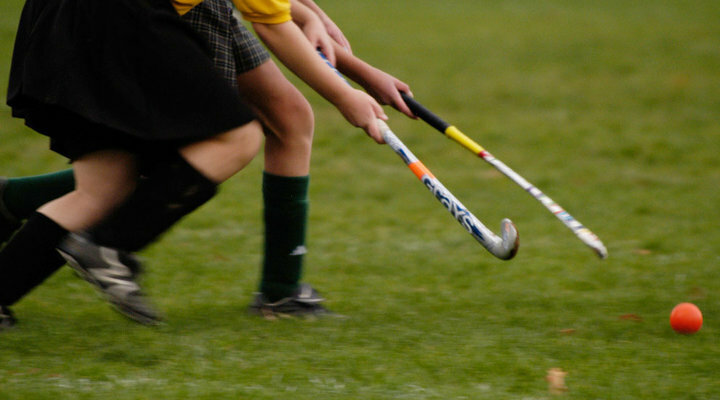 The tight crop on the field hockey players' sticks as they run after the ball show action as does the intentional blur. Vary your shooting and compositions to include horizontals and verticals; remembering to place more negative space in the direction the athlete is heading "into". D5000, 55-300mm f/4.5-5.6 lens, 1/640 sec., f/13, ISO 320, Matrix metering. The shutter speed stops the action. Placing plenty of negative space to the right of the running player produces a nice composition. D5000, 55-300mm f/4.5-5.6 lens, 1/1000 sec., f/8, ISO 320, Matrix metering. The background is far enough away that it blurs nicely, separating the athlete for a nice candid portrait taken mid-game. D5000, 55-300mm f/4.5-5.6 lens, 1/1250 sec., f/9, ISO 640, Matrix metering. This image was originally a horizontal but we cropped it vertically for a stronger composition. Don't just shoot action shots, but capture images like this one, showing the deep concentration of the softball pitcher about to throw the ball. Just before the softball is released from the pitcher's hand, you can see the concentration in her expression. The quarterback getting ready to throw the ball is a relatively easy image to shoot, as you can see when and where the action will begin. D5000, 55-300mm f/4.5-5.6 lens, 1/100 sec. at f/4.8, ISO 1600, Matrix metering. Great shots include reactions from the athletes as well as action shots. A shallow depth of field (wide aperture) makes this candid profile of a cheerleader on the sidelines stand out from the background and others on the squad. Along with actions shots of the players and candid reactions you can make great photos of the gear on/off the field. Almost all of us have times when we need, or want, to shoot a sporting event. Perhaps your child is in a soccer program, a friend's kid is on a school softball team, a nephew in high school competes in track, or you're taking your camera to a professional event. Regardless of the sport, you can do several things to make the best pictures possible. First, think about where you want to position yourself. Think about where most of the action occurs in the sport you’re photographing. In some sports, you can catch the action coming at you, if you’re positioned correctly. Sometimes the top of the bleachers is the best place to shoot from, for that high angle, looking down on the court (especially good for volleyball). With amateur events, you can often move around and try different spots. If possible, leave the stands and go to the sidelines. That will put you closer to the action and at the players’ eye-level. Once you begin photographing a particular sporting event, you’ll begin to realize that each sport brings its own sense of timing of the action. The more you shoot, the better your timing will become. Even the pros practice shooting at the beginning of a season to hone their sense of anticipation of the action of the game. The best photos are taken at the peak action; this would be right as the basketball player jumps up to make a basket, just before a volleyball serve or when the cheerleaders have completed a pyramid. In baseball, action in the infield (catching, throwing, plays at bases and home plate) usually make the best pictures. In soccer, the most important action usually happens near the goal. COMPOSITION: Think about your composition. Is the background cluttered? See if you can safely move to another position where you can compose an image that isn’t full of distractions. LENS CHOICE: More than likely you’re going to want to use a telephoto lens on a Nikon DSLR, or a COOLPIX camera with a large zoom range. The most popular zoom lenses often reach out to 200mm or 300mm. The tighter you can shoot (the more you fill the frame), the better the pictures will look. AUTOFOCUS: If there's fast action, make sure to change your camera's autofocus setting to Continuous. That way it will track the action to keep the photo in focus. And you may also want to set the AF points to Dynamic Autofocus to make it easier to keep the focus on your subject. If your camera has scene modes, you can choose the sports setting, which tells the camera that you are shooting sports and will need a fast shutter speed to capture the action. FOCUS LOCK: If you seem to have trouble following the action and keeping it in focus, try setting the focus at one place and waiting for the action to get there. For example, during a baseball game, you can focus on a particular base and wait for the runner to get there. And, if you're pre-focusing on one spot, use either the focus lock button (often labeled "AF-L, or “AE-L AF-L”") or switch the autofocus to Manual and adjust it by turning the focus ring on the lens. The three things that control a photograph's exposure are shutter speed, lens aperture and ISO. SHUTTER SPEED: The longer the camera’s shutter stays open the more light enters. To stop action, a fast shutter speed is needed; the exact shutter speed needed depends on the subject you’re shooting. To avoid blur, try to get your shutter speed fairly high; 1/500 should be the minimum and 1/1000 or above is even better. You may have to raise your ISO for the shutter speed you want to use. ISO: The ISO setting controls the sensitivity of the camera to light. A higher ISO setting (ISO 1600 or 3200) is more sensitive to light and allows a faster shutter speed (or a lens with a slower maximum aperture) to be used. Indoor sports can be especially challenging to photography for a number of reasons. Often, the venue—whether a professional sports arena or high school gym—is not well lit. And, the lighting may be a mix of unusual colors such as florescent, tungsten and mercury vapor. Digital cameras need to know the color of the light coming from the light sources in order to make sure the final image displays correctly. Since each type of lighting is a different color the camera must compensate (just like our eyes and brain do). In these situations a custom preset white balance (if your camera supports it) may yield a better result. A camera's built-in flash generally has a fairly short working distance, perhaps to 10-20 feet, or less in a large room with no nearby walls or ceilings to help reflect light. A more powerful hot-shoe mounted flash can extend the working distance of the flash, but may still have trouble lighting all but the closest subjects in a large gym or arena. Be sure to check with the coach, referee, or event official before using a powerful flash, as sometimes flash can be distracting or dangerous to the players. When professional sports shooters are on assignment covering indoor sports, they’ll often have access to rig lighting in the arena’s rafters, so the flash lighting comes from above and therefore isn’t aimed into the players’ eyes. We all can’t be so privileged, so we have to use photographic technique and our gear to our advantage instead. As we learned above, to capture the action of fast moving athletes, you generally need to use a fast shutter speed to stop the action. In order to use a fast shutter speed a lens that allows a lot of light in, one with a fast maximum aperture is required. If your lens is not fast you can boost the ISO value to compensate, but be aware of the limitations when using high ISO settings. In many cases, as in high school gyms, the light level is sometimes so low that even with a high ISO (like 1600) and aperture of f/5.6, the fastest shutter speed that can be used still will not be fast enough to stop action. In these cases the only option is to use a lens with faster maximum aperture, such as one that opens to f/2.8. To further complicate indoor sports shooting, generally you will be far from the action and a long focal length will be needed to "zoom in" on the subject. Most zoom lenses are "variable" aperture which means that as you zoom their f/stops become smaller and gather less light. A variable aperture lens might have an f/stop range of f/3.5-5.6, which means its widest aperture is f/3.5 and when you extend the zoom, the widest aperture closes down to f/5.6. A "constant aperture" lens, like the AF-S NIKKOR 70-200mm f/2.8G ED VR II lens has a fast f/2.8 aperture through its entire zoom range and is an ideal indoor lens for sports. Another option would be to use a fixed focal length lens, such as the AF-S NIKKOR 85mm f/1.8G. At first it can be more difficult to shoot with a fixed focal length lens (since you can't "zoom" in and out) but these lenses are generally much faster and more economical than a fast zoom lens. While there are many different options and settings available on most cameras, the settings below will give a Nikon D-SLR user a good starting place for indoor sports shooting. • If your camera has an Auto ISO feature, turn it on and set the Max Sensitivity to ISO 1600 and the Min Shutter Speed to 1/60 of a second. You may need to adjust this setting if you find that 1/60 of a second isn't fast enough to freeze the action. • Focus settings can vary greatly depending on the sport you are shooting. In general, one of the "Dynamic-area AF" modes will be the best for many sports. For COOLPIX users, the basic "A" Auto shooting mode will generally be the best option, however, in dimly lit venues many compact digital cameras won't have high enough ISO settings or lenses with fast enough apertures to stop most action. Other great images can be made of the gear on the field, such as a pile of hockey pucks or baseball bats leaning against a fence. While shooting indoor sports can be challenging, with good equipment, some skills and practice it's possible to get well-exposed, sharp photos in most locations under most conditions. Finally, remember that just because the action is over, the emotion isn't. Those moments can be just as important as the action shots. Capturing the action of a sporting event is easy when you follow a few simple guidelines.